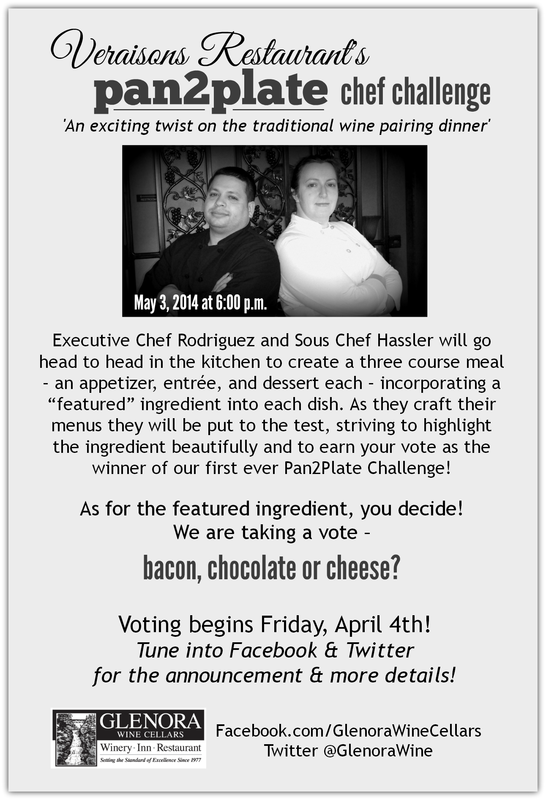 Pan2Plate Chef Challenge: Bacon, Chocolate or Cheese? We’re extremely excited to announce our plans for the upcoming wine pairing dinner at Veraisons, taking place Saturday, May 3rd at 6:00 pm. It’s an exciting twist on the traditional wine pairing dinner, where Executive Chef Rodriguez and Sous Chef Hassler will go head to head in the kitchen to create a three course meal – an appetizer, entrée, and dessert each with wine pairings– incorporating a “featured” ingredient into each dish. As they craft their menus they will be put to the test, striving to highlight the ingredient beautifully, select the perfect wine pairings and to earn votes as the winner of the first ever Pan2Plate Chef Challenge! As for the featured ingredient, we are taking a vote – will it be bacon, chocolate or cheese? Voting will begin Friday, April 4th following an announcement on Facebook and Twitter and will last one week, concluding on Friday, April 11th. The featured ingredient will be announced the following Monday, April 14th and Chefs Rodriguez and Hassler will get to work creating their menus, which will be announced Friday, April 18th. The creator of each menu will not be revealed until the night of the dinner; providing a “blind” tasting for the guests. After each course has been enjoyed and judged the chefs will come into the dining room and reveal which dish was theirs for each course. After the judging of the first course, Chefs Rodriguez and Hassler will enter the dining room and reveal which dish was theirs. Entrees come next, followed by desserts, which will be judged and revealed in the same manner. At the end of the meal, the results from each course will be tallied to reveal a winner. The dinner costs $60 per person, plus tax and gratuity, and reservations are required. They can be made by calling 800.243.5513.